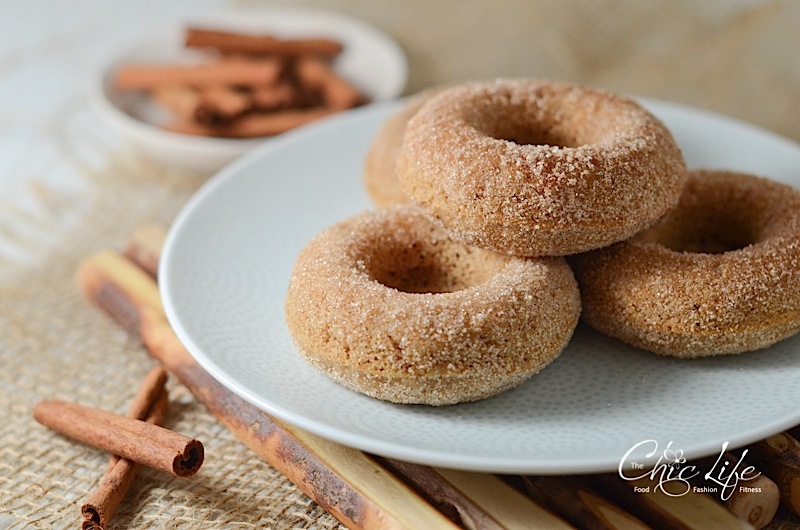 When reader Meg wrote in asking if the substitution on the all purpose flour to spelt flour was one-to-one on my baked apple cider doughnuts, I was reminded that I haven’t baked with spelt flour in awhile. I definitely picked up a small bag the next time I was at the health food store for some baking projects. 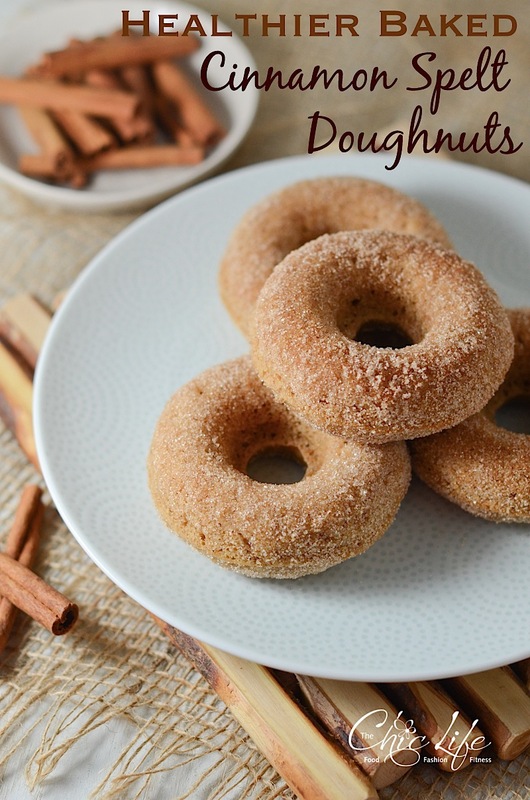 Spelt doughnuts sounded like a pretty good dessert for this past weekend, so I came up with a couple simple changes based on some of the other doughnut recipes here on The Chic Life to make a recipe specifically for spelt flour. 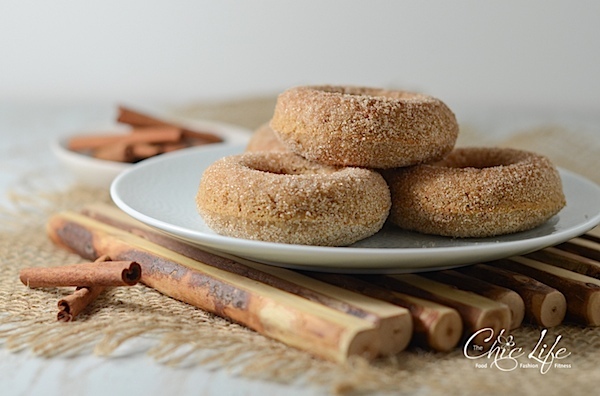 I made a Healthier Baked Cinnamon Spelt Doughnuts Recipe. 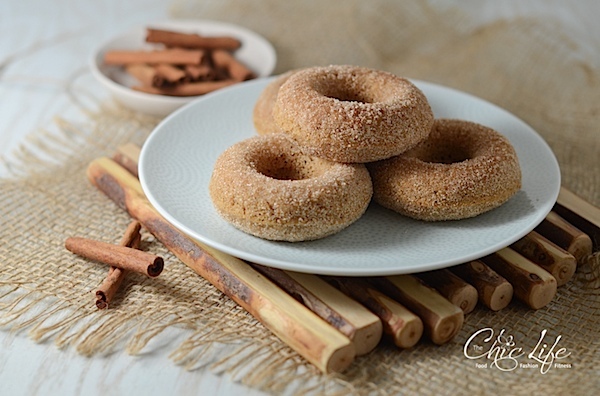 This Healthier Baked Cinnamon Spelt Doughnuts Recipe is a little heartier than the other doughnut recipes I’ve made with all purpose flour thanks to the spelt flour. I still enjoy the texture and find these doughnuts to be slightly more fluffy and light than whole wheat. But, I love baking with spelt flour! Spelt flour gives these doughnuts a heartier texture that is somewhere between what all purpose and whole wheat flours would yield. If you’ve never baked with spelt flour, this would be a great introductory recipe. Easy, fast, and satisfying, these doughnuts are a no brainer. You could add a simple glaze on top, but when I’m feeling lazy, a quick dip in cinnamon sugar adds pizzazz without much extra effort. As with my other recipes, I call this “healthier” instead of “healthy” because I’m not sure what would make a dessert healthy unless it was comprised of fresh sliced fruit. So, let’s just agree this is a “healthier” than traditional fried doughnuts…and even lighter and less sweet than some baked versions! Pre-heat oven to 375 degrees F. Brush a 6-count doughnut pan lightly with melted butter (or spray with non-stick spray). In a medium-large bowl, add spelt flour, 1/4 cup sugar, baking powder, 1/2 teaspoon cinnamon, and salt. Whisk to combine. In another medium-large bowl, whisk together 1/4 cup plus 2 tablespoons milk, egg, canola oil, and vanilla extract to combine. In a small bowl, whisk together (or stir with fork) 1/4 cup granulated sugar and 1/2 teaspoon cinnamon until cinnamon is evenly mixed in. When doughnuts are safe to touch, but while they’re still warm, dip each side into the cinnamon-sugar mixture, pressing and twisting to get good coverage. Thanks for stopping by! Hope you enjoy this Healthier Baked Cinnamon Spelt Doughnuts Recipe! these look so delicious! i still haven’t tried spelt flour but i want to soon! I made these minus the healthier part :/ (I used a bit of extra butter and regular flour…guilty) and they turned out great! Hi there, these look great …….I use spelt almost exclusively. I’m wondering if the dough is thick enough to pipe or roll out and cut with my vintage donut cutter as I don’t own a donut pan. Thank you!